New York Film Critics Circle certifed Showbox is best app in market to watch movies without facing issues. Though festival tiredness (and madness) may be partly to blame, I’m going to give most of the credit for my weepy Friday morning to Okja, the new film from South Korean director Bong Joon-ho which premieres Friday at the Cannes Film Festival. A rollicking rescue movie with deep ache and hope in its heart, Okja feels like just the right story for this grim political moment. It’s something of a clarion call to those resisting the creep of various -isms—capitalism, totalitarianism, fatalism—without succumbing to sanctimony or sermonizing. It’s also funny and thrilling, chock-full of masterfully constructed set pieces that spin and chase with dizzy brio. Bong’s last effort, Snowpiercer, was also a stunning action-adventure that housed a bracing political message. But unlike that grim and grinding film, Okja has a lightness to it. It’s more poignant satire than furious screed. Still, it takes hard aim at corporate evil, imagining a meat conglomerate called Mirando (sounds a bit like Monsanto, no?) that has bred a litter of “super pigs.” They’re given to 10 farmers around the world to be raised humanely and naturally, a publicity stunt used as cover for a sinister truth. 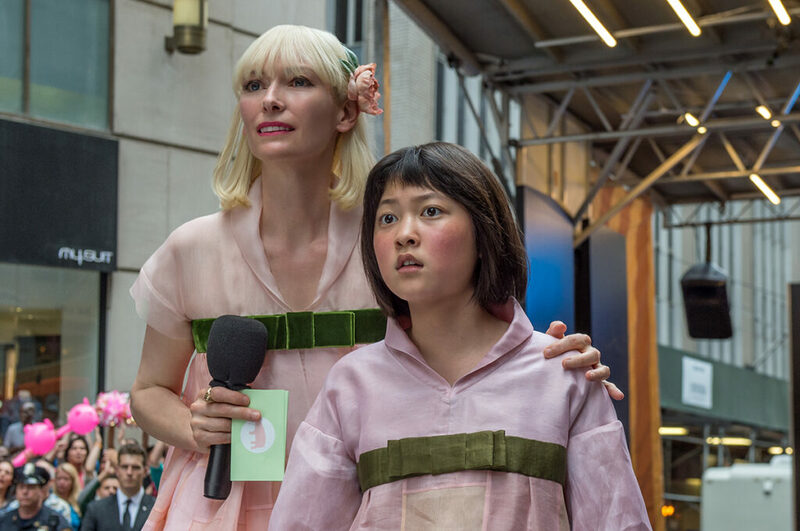 Ten years later, one such pig, Okja, is living in the bucolic mountains of South Korea with her owners, teenage Mija (a soulful, winning Seo-Hyun Ahn) and her kindly old grandfather (Hee-Bong Byun), when Mirando comes calling to assess the pig’s progress and take her back to New York City to be used as advertising. To read the rest of Richard Lawson’s Vanity Fair review click here. Copyright New York Film Critics Circle © 2008-2018. All Rights Reserved. Movie reviews and titles provided by MRQE.com - the Movie Review Query Engine.